There aren’t too many things better than camping! As much as I love camping, there are always one or two little things that you wish could be changed. One of the biggest complaints we normally hear at Amazing Outdoor Adventures about your average tent is the lack of privacy, and that’s a pretty fair statement. It’s hard to get alone time for even a quick change when everyone is in the same small or rectangular area. While the only solution for complete privacy is to go camping all by yourself in the middle of nowhere (which generally not as fun but there is a time and a place – yes wild women and wild men & long distance backpackers, we see you there) – there are some tents that are designed to add extra privacy to camping trips by creating multiple rooms and private areas. These tents won’t provide complete privacy, but even having a little private area can help make your camping trips much more enjoyable. These are some of the best 3 room tent reviews broken down by company – because camping all by yourself in the middle of nowhere just isn’t nearly as much fun most of the time, but neither is feeling crowded while you’re out in Mother Nature trying to relax. Updated for 2018 – Here is our quick list of the best 3 Room tents that we reviewed. We have added some new tents and had to remove one that no longer meets our criteria to be included. Below this quick reference chart is a much more detailed review of each individual tent – and the reasons why we had to remove one! Ozark Trail 16×16 3 Room Instant Cabin Tent for Sale! The Ozark Trail 3-room version of the instant cabin tent is by far the easiest multi-room tent to setup. With pre-attached poles, the setup is basically already done for you – all you need to do is snap everything into place. We can safely say setup should only take between two to three minutes to complete, and with two people who know what they’re doing, it can be even less. I love the look, which is almost L-shaped, and it does have a front “canopy” area for a little extra shade. This is the perfect spot to place some lawn chairs during the hottest part of the day and crack open a soda or a beer based on whatever your preference is, and just enjoy the day, the shade, and the company! Also sometimes referred to as the Ozark 16×16 3-room tent, this classic design deliver plenty of space for eager and active campers. Each room measures roughly 8’ x 8’ and has enough room to fit an air mattress and some gear. The walls zip closed, so it really does feel like you are in three individual tents (and it also makes it easy to separate adults from children). There are seven total windows, allowing plenty of airflow for each individual area so everyone can stay comfortable and in their own little private sleeping area. This is especially great for introverts who have their group of close friends, and love to come out camping, but they also just sometimes need their own little space to recharge. This Ozark Trail 3-room tent is one of the more expensive options, usually somewhere around $350. Also, pre-attached poles tend to snap or break easier than tent poles that are not pre-attached, so be gentle during take down and storage. This is the perfect tent for a group of friends that want a little extra privacy at night, and we’re proud to have it at the top of our list of the best options currently available. This new 3-room Ozark Trail tent is a very different design from the classic instant family tent (which is still good enough to easily sit as one of our top options on this list), but we love what they are showing heading into the 2018 camping season. This three room family tent is extremely spacious with clear side rooms that all lead into a main center area that is the largest room of them all. The mesh top allows you to enjoy the stars and moon on a clear night or the breeze and sun during a great day – yet the rain flies and tarps can easily be added to natural attachments to keep any rain out if the clouds should make their way in when the weather turns. A great gray and blue color, this outstanding tent not only looks great but performs the way you want it to even with large groups. This would have been a welcome addition during our scouting days for sure! The fact it’s from the trusted name of Ozark Trail (there’s a reason they show up on our best tent articles so often) is all the better. This is a heavy duty tent so the full carry weight is 46.7 pounds (that brings back memories) although aside from multiple media pockets, large mesh pockets, and gear hammocks in the interior there are multiple other places to store important items you don’t want on the floor. You can even set up an e-port for electricity in a campsite with amenities available. Not our thing, but to each their own! This is a fantastic new option when it comes to high quality 3 room tents and you won’t be sorry if you go with this model! Just because it has a specialty name doesn’t mean you should blow it off. While this isn’t designed quite the same way as many other three room tents, there are a solid two here in addition to a smaller side room that works as a screened in porch, but can also have covers zipped up over the mesh to easily create a third room that is great for small kids. While some people would call this a two room family tent with a porch but when the porch has a floor, a ceiling, and walls – we’re good with calling that a room! There is one major center door in addition to a side door on each side. This gives the opportunity for an appropriate amount of privacy and the room dividers can be rolled up if this isn’t a big deal. This versatility can be great for being social and out and about during the day but then giving everyone the ability to put down the dividers when night arrives. Taped fly seams offer extra protection to prevent leaking, and it is completely possible to even fit in three full sized queen air mattresses in this tent for extra comfort sleeping at night. Approved for sleeping room for up to 10 people (maybe cut it down to 6-8 if you all are decent sized adults), this offers plenty of space to go with privacy. A very versatile tent, there’s a lot to like about what this tent has to offer, and we’re glad to add it to our list of the top 3-room tents that are currently on the market. Add in six big screened windows for plenty of air flow on those sunny but breezy summer days and the versatility of this tent is what really stands out to us and many happy campers enjoying what this tent brings to the table. You won’t be surprised to learn that we’re huge fans of the Core brand of tents, as they consistently make some of the best large tents currently on the market. And we care about quality above all else – it’s the number one reason other tents get bumped off our top 10 lists. However the Core 12 main instant cabin tent is in no threat of that at the moment. Not your traditional three room tent, this is a big open cabin area that has two separate room dividers that can be rolled down from the ceiling to create a 3 separate room set up or rolled back up and secured to the ceiling. The special instant cabin design means setup can be a breeze in as little as 2 minutes even with only two people doing the setup (Jon and I are both jealous of this based on our memories of setting up a behemoth of a family tent as youths). There is space for three different queen sized air mattresses, and even more space without them. This is a rock solid tent and while it might not quite have the privacy of a ConnectTent or a large party tent, this is a high quality and legitimate option for those campers who are looking for the functionality and space that these outdoor camping tents can provide. This is a solid buy for any season, and for many individuals it will be a great option when looking for a rock solid 3 man tent. Core is also on the top of our Instant Tent List: again, because we are huge fans of their products! This is just a great all around tent! Any best 3 room tent reviews list would not be complete without this Ozark Trail tent listed. This tent is suitable for either family camping or for camping with a larger group of friends. The biggest drawback to this tent is there is only one front entrance, so each room does not have its own private entrance and exit like some of the other options have. Each room is big enough to fit a queen sized mattress, and since it is a cabin style tent, there is plenty of headroom. The front porch area is perfect for providing some shade during the day, and creating a nice socialization space. The tent is very affordable, somewhere from $180 to $220 depending on sale price. The setup does take some time, normally 20 to 30 minutes depending on expertise level, which actually is pretty standard for the more heavy duty 3 room tents. Ozark Trail also offers a version of this tent that is almost identical, but without the front porch. Not having the front porch will make the tent more affordable, but you lose the benefits of having that porch space. We recommend that if you are going to buy this tent, spend the extra money to get the full amount of space. You’ll never regret giving yourself a little bit more space. This 3 room tent is definitely an interesting addition, and is being added with the April 2017 update to this article, a full year after it was originally written. Like I said, we like to keep ya’ll updated. While our top 5 doesn’t change as those are clearly the head and shoulders top options when it comes to getting a roomy divided tent however recent reviews of this tent from Texsport indicates they may have upped their game as far as creating a really good tent that has fixed many of the past problems of potentially leaky seals. While it has good, not great, reviews online there’s a distinct pattern of really good and great reviews the past couple years with most the negative ones from 2014 or before. They’re trending in the right direction and although we’d recommend the top five on this list (obviously), this does add a legitimate other option that is good looking, comes with a quality rain tarp, and is flame retardant to boot. This increases the safety while offering the full array of conveniences you hope for from a multi-room tent. This tent comes with an electrical access port as well as stakes so you can get set up from the get go and with the right power source recharge those electronics that you will find yourself needing later in the day. Definitely a worthy one to consider as long as they keep the quality up where it needs to be. This is our favorite multi-room tent for family camping! Update: This is still an absolutely great tent but it has been unavailable for several months as of this update. We’re waiting to see if they roll out a new version, re-start production, or what the deal is before we we move this back up the list. If you follow the link and it is there, then by all means, we still fully support this model and it’s incredible construction and setup! This is the most unique choice for the best 3 room camping tents. It isn’t one tent with separate rooms, but rather 3 tents that are connected together with passage ways. Setup is generally 15 minutes, and you set up the individual tents first than connect them all together. The middle tent is the biggest with manufacturer dimensions of 10’W x 9’D x 72”H. The two outer tents have manufacturer dimensions of 7’W x 5’D x 42”H. You can also only set up one or two of the tents if not all three are needed. Each tent has some storage pockets, gear lofts, and a separate entrance. It is also lightweight, making it easy to store, back up, and carry around. This is a bit unusual for larger tents but it is definitely a positive because who likes hauling around a really heavy and bulky tent? I love this tent for family camping, where the parents can have the middle tent, and children can be divided into the side tents. This tent is a head turner; there are not many on the market like it, making it perfect for people looking for something a little bit different. The average cost for this particular tent is also excellent, normally around $175, making it one of the best values currently available for a multi-room tent. We do have a current list of available Connect Tents here. Looking to have a little fun camping? Here is our recommendation. We like this tent, well, because it just looks like a fun party tent. Technically, it is a 3 room tent, but we should clarify that a little bit. There is one center divider that separates the space into two rooms, and another divider that can be used to create the 3rd room. They are not the most private of areas the way that many of the other tents on this list are, but they do allow for division of the tent into 3 separate spaces. The selling point with this tent is size. It is a 14 x 14 space when setup, and it has a whopping 87 inch height. It is the perfect tent to socialize in, but still have a room blocked off if someone needs to take a nap. It is heavy, weighing about 55 pounds, but is perfect for a longer camping trip where lots of storage space is needed, and a large social space is required. We recommend this as the perfect party tent for a group of friends. Some tents are perfect for families, some tents are perfect for couples, and this is the one we love for re-connecting with the buddies and really enjoying the outdoor reunion our way. So I guess you could say this is our #1 choice for a 3-room party tent for your next outdoor get-together with friends. While we love to find great new products to share with you guys, sometimes we notice a bunch of poor reviews come in, receive e-mails from outdoor enthusiasts who had a bad experience, or all too often hear about a shift of jobs from Europe or America to manufacturing in countries that don’t have the same quality standards. Whatever the reason, sometimes a product we once recommended loses its high standard of quality and when it does, we can no longer keep it on our list. As with when this always happens, it might be there were just a bad streak of reviews or instances, so we keep the review up at the bottom of the article in case you decide to take a chance. We will keep an eye on them in the future to see if things improve, but as of early 2018 the Semoo 9 person family tent we originally had on our list is no longer one of our top rated. This is our #1 Rated Tent for families with younger children! This is one of the best 3 room tents for families. 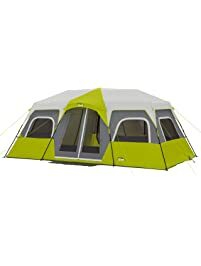 This tent has two dividers, so depending on the situation, you can have one large family room, 2 rooms, or 3 rooms. There are four doors, two into the main entrance, and one on each side which gives each room its own separate entrance and exit. All the doors and windows allows for great ventilation, helping to keep the tent cool during summer afternoons. It has an eye catching white and blue color scheme, with a very affordable price tag around $200. I highly recommended this tent for families because of two reasons. One is because it provides ample space for 5 or 6 people and a couple of pets. The other is because of the room dividers. The room dividers are very easy to unzip, so for families with younger children, if they get scared in the middle of the night, simply unzip the dividers and you have one big family room again in just a matter of seconds. This adaptability is definitely helpful and makes for a great camping experience especially in the beginning as you are getting children used to sleeping outdoors and camping. Update February 2018: As of right now, we can no longer recommend this tent and put it firmly in the “buyer beware” category. We hope those ratings change in the future (no one suffers from more great multi-room family tent options) but honesty must come before profits so this tent is no longer on our top rated multi-room tent list. There are a lot of fun three room camping tents to pick from. All of them provide some extra privacy to try and make your camping trip more enjoyable. We would recommend picking a tent that has all of the features suited for your personal situation. If your camping trips are mostly with friends, pick a tent that has separate rooms with separate entrances. For family trips, pick a tent that can easily go from one big family room to separate bedrooms in a flash, and for a party tent, pick the Ozark Trail 14-Person Vacation Home Cabin. You will not be disappointed with this amazing large tent! If you need ideas on where to go for a family camping trip, check out this article on fun family camping destinations! Check out this video from Ozark Trails about our highly rated Ozark Trail 16 x 16 3 Room Instant Cabin Tent!